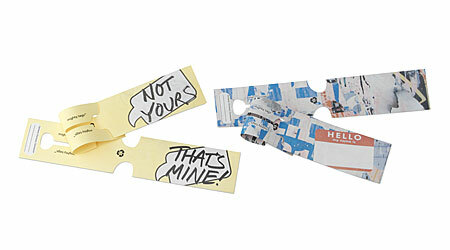 You'll be sure to spot your bag on the luggage carousel with these bright tags full of personality and attitude. Lightweight and highly visible, these playful tags by Terrence Kelleman are made of Tyvek, a material that looks and feels like paper but is virtually indestructible. Made of 25% post-consumer material, they are 100% recyclable. Choose from "That's Mine/Not Yours" or "Hello my name is." Set of 10 tags per style. Made in China. This product was made by hand. Click icon for more information. 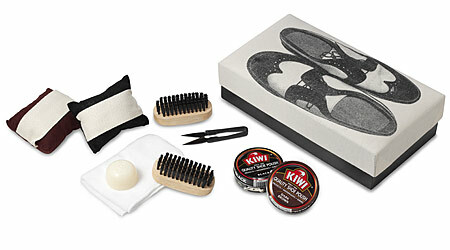 A timeless ritual gets a modern update with this handsome shoe shine kit. The padded lid is made from organic cotton and has a silk-screened image of a pair of oxford wingtip shoes for a classic, retro feel. The divided wooden keepsake box comes with everything you needs to keep your shoes looking their best. Handmade by South African artisans who use local, sustainable resources, this beautiful shoe shine kit will bring a bit of luxury to an everyday routine. 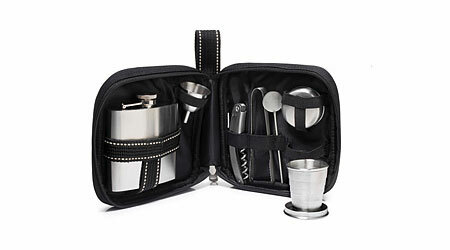 Enjoy a cocktail wherever you travel with this sleek canvas bar kit. The compact, insulated case features a flask (with a captured lid so it can never get lost), funnel, corkscrew, stir stick, ice tongs and clever telescoping shot glasses. Ideal for tailgating or traveling, the bar tool kit makes a great gift for anyone with a thirst to go. Assembled in the USA. James Bond Would Be Jealous!